Sound is created when the air around us is disturbed by movement. When we speak our vocal cords in the throat vibrate. The vibration of the vocal chords is many hundreds to thousands of times a second and this causes the air near to them to be momentarily compressed and expanded at the same rate. The rhythmic (periodic) compressions of the air move out and away from the vocal chords, up through the throat and out through the mouth. If we could see the compressed air it would look as if the sound was travelling out, rather like waves travelling out in a pond when a stone is thrown in. The waves travel quite fast, about 330 m/s for sound in air (the speed of sound). Eventually the waves might travel across the room and fall onto our ears. The sound waves enter the ear and, deep within the ear, tiny hairs are set in motion in direct sympathy with the motion of the airwaves. The movement of the hairs trigger electrical impulses that go to the brain and we have a sensation of sound – we hear it. The brain is a marvellous 'computer', trained by us over the whole of our lives. Our brains can identify whether we have heard a sound before (out of the many millions of sounds we have heard before) in a fraction of a second. Sound is wave motion in air. Each air molecule knocks against its neighbour and transfers sound energy along the line. The air molecules themselves might not go very far but the energy, or sound wave can go a long way. Without air there would nothing for the waves to travel in. Just as you could have no sea waves, set up by the winds, without the sea, there would be no sound without the air. At the start of the movie, Alien, is written 'in space no one can hear you scream' and they are quite correct because there is no air in the vacuum of space! An amazing diversity, range and type of sounds are around us. The number of vibrations per second of the sound gives it its note, or pitch; the strength of the vibrations gives it its loudness. Birds song is fairly high note (many vibrations / second), a watch ticking even higher but also much softer, a construction workers drill is quite a low noise while aircraft engines even lower in pitch but even louder! Although our ears are very sensitive they are limited in their ability to hear all types of sound. The sound waves are caused by vibrations and these are characterised by the number of vibrations per second that set them up. Our ears can hear from about 20 to 20,000 vibrations / sec. The low notes of bass musical instruments are around 50/s while high notes such as flutes and tin whistles are 1000's /s. Bats use sound waves as high as 50,0000/s but these are outside of our human range and are called ultrasonic. The Phonograph was invented by Thomas Edison in 1877, who discovered how to record music and voice. The mechanical recording of sound took many years to perfect but eventually reliable recordings were made. The sound was recorded on a groove on a cylinder of tin foil that was rotated by hand. 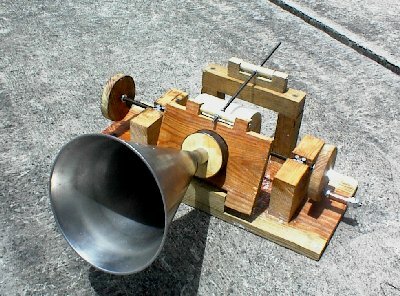 Sound was gathered by a horn that was attached to a mouthpiece and diaphragm. The sound causes vibrations in the air that travel down the horn causing the diaphragm to vibrate. This in turn was connected to a stylus pressed into a cylinder covered in tin foil. When a handle was turned the cylinder rotated and also moved very slowly along. The stylus pushes into the foil and when the cylinder is rotated a spiral grove is therefore cut into the foil. The depth of the groove was determined by the amount and type of vibration that the stylus received (the sound picked up by the horn). The result was that the tin foil contained a record of the sound as a series of tiny 'hill and dale' undulations within the groove. Playback was achieved by using the stylus to translate the groove back into vibrations on to the diaphragm and this in turn to the horn from which the sound could be heard! Each recording only lasted a few seconds and the foils quickly wore out. It is amazing to think that something that simple can record and playback sound! Although the phonograph idea is simple enough it was a triumph of engineering, as the movement of the cylinder and groove need to be very accurately aligned in order for the machine to work at all. This is a difficult thing to do and really requires precision engineering!! The phonograph is made up of several parts. Firstly the horn is used to collect the sound. 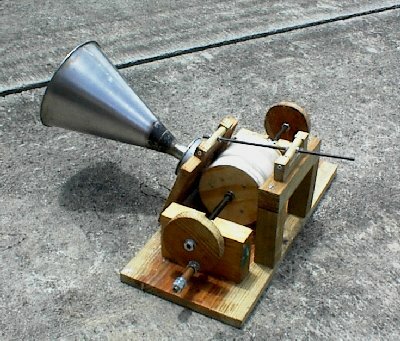 This can be made of cardboard, in the Rough Science version we used a large metal funnel. At the bottom of the horn we need to fix a diaphragm. The diaphragm needs to be made of a thin but stiff material that will be strong enough to hold the stylus but be able to vibrate to the sound. We found that we got very little vibration by fixing the diaphragm directly onto the horn. However, when we used a small tin can fixed to the horn it worked very well (the tin can acts as a 'sound box' and increases the efficiency of transfer of sound to vibration). The thin metal bottom of the can formed the diaphragm. In the middle of the diaphragm we pushed a drawing pin through to form the stylus. As a simple test when you talk into the horn you can easily feel the drawing pin vibrate. The recording cylinder we used was formed of two wooden circles mounted on a piece of studding (long thread). These were held apart and fixed in place by wooden blocks between them and the whole thing was then covered in many layers of wax till we had built up a wax cylinder. Two nuts were placed on the thread and these were held in place on two supports fixed to the wooden base of the phonograph. A handle was then placed at one end of the thread. When the handle was turned the cylinder rotated but because of the screw thread it also moved along. The wax cylinder now needs to be made as precise a shape as possible. This is done by holding a razor blade firmly onto one the side of the wax disc while turning it fast. When the handle is turned very fast the razor shaves off excess wax. You don't need to move the razor as the cylinder will move along on its own accord. If this is done a few times a wonderfully smooth and precision cylinder of wax can be produced. The horn-diaphragm-stylus unit then needs to be fixed onto the base but able to move so that the position of the drawing pin on the wax can be adjusted. This is best done using a hinge of some construction and another screw thread to make the final adjustment onto the wax. To make a recording, or rather an attempt at a recording, wind the cylinder to one end. Place the drawing pin stylus onto the wax so that it pushes in about 0.5 to 1 mm. If you now turn the handle just a half turn the needle clearly digs a grove into the wax. If the groove disappears at some points along the spiral it is probably because the wax is not even/smooth enough and you will have to shave a little more off. Then when you are happy the groove is good, turn the handle at an even rate (say 2-3 times a sec) and talk/shout loudly into the horn for half of the length of cylinder. Stop halfway and re-adjust the drawing pin into the wax so that it is only just touching the wax (say 0.1 to 0.5 mm into wax). Use the last of the wax to record another shouted message as you did before. If you are amazingly jammy-lucky you might have two recordings, if just jammy, one recording and if you are just normal lucky it won't have worked!! I would guess that you have a 1 in a 100 chance of it working when you first try it out – you need a lot of experience and experimenting to record something. Assuming that you have something recorded onto the wax cylinder it's now time to try and play it back. After coming to the end of the wax, carefully remove the drawing pin stylus from the wax and make sure it is well away from the cylinder. Wind the handle in the other direction so that the wax cylinder is brought back to the start position. Now very carefully put the stylus back onto the start of the grove but this time slightly less deep than you had it for recording. Turn the handle at the same rate and direction as you did when you recorded the sound and listen. The stylus will pick up a noise from the rough groove but 'on top' of that noise, if you are very lucky, you will hear your recording. 1) When recording and playing back the groove it might be better to have the horn-cylinder-stylus balanced with weights rather than fixed in place. You can then record with one set of weights and playback with less weights on the 'stylus'. Once you have got this system working (with much experimentation) it will improve the chances of success. 2) The only problem with the wax is that it is really to soft to reliably record onto. Once you have got the wax to work and you have made a smooth wax cylinder you could try putting a very thin layer of aluminium kitchen foil around it and try recording the sound onto this. This should eventually work much more reliably. 3) We used a drawing pin as a stylus and we experimented a bit with bending the pin so that it cut into the wax at different angles. If you try using the foil you might find this stops the foil being torn so much.